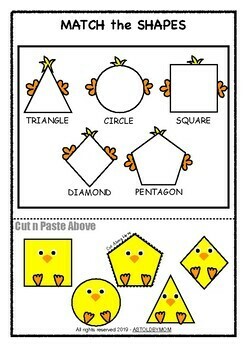 This Cut & Paste Shapes Activity will help students identify and distinguish various basic shapes. Students will have to match and paste each baby chick to its corresponding figure to complete the chicken. [In case the sheet is laminated you can use velcro dots]. The name of every shape is also written in capitals below it. If you are looking for additional resources check them out below!